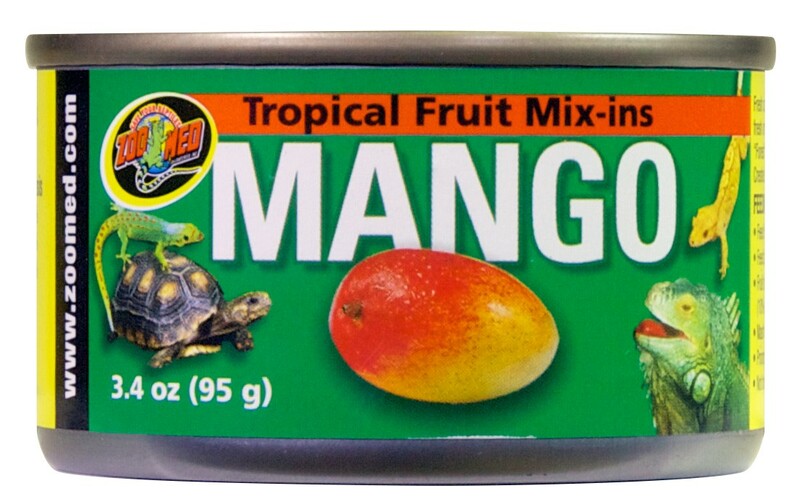 Tropical Fruit Mix-ins Mango | Zoo Med Laboratories, Inc.
Fresh canned fruits in sauce to be used as a “mix-in” with fresh pelleted diets. Great for Tropical Lizards, Box Turtles, “Forest” type species of Tortoises, Hermit Crabs, Iguanas, Crested Geckos, Day Geckos, etc. Fruit should be no more than 20% of the total diet. (10% with forest Tortoises). Mango, Water (sufficeint for processing), Guar Gum, Vegetable Oil, Potassium Chloride.